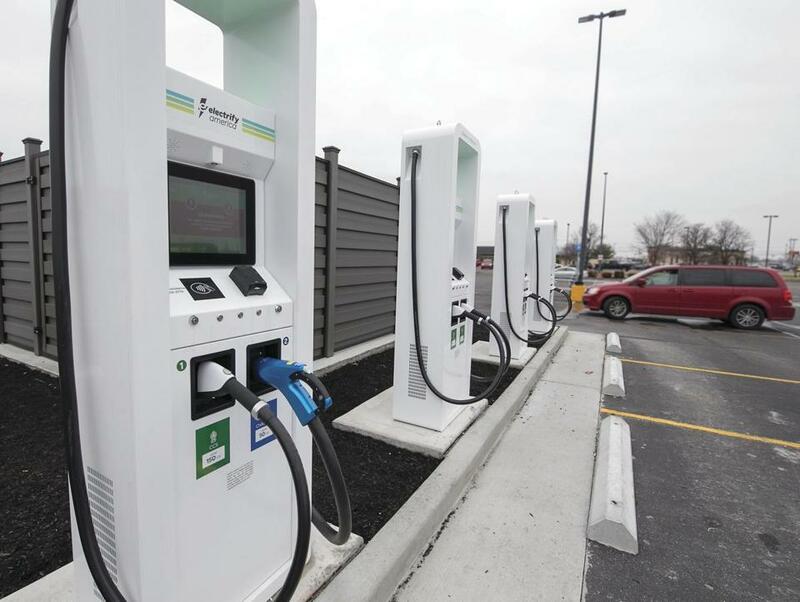 An electric car charging station opened Jan. 16 in Paducah, Ky., located at the side of the parking lot at a Walmart store. It’s all about cars and houses. The new carbon-reduction plan produced for the city and unveiled on Tuesday makes for sobering reading, in part because of the enormous logistical challenges it highlights, and in part because it throws cold water on some of the more crowd-pleasing approaches to fighting climate change at the city level. Rooftop solar? It’s nice, but won’t make a big dent in the city’s emissions. Bike lanes? Great from a liveability perspective, but they won’t cut greenhouse gas emissions much either. Instead, the report makes clear that the success or failure of the city’s climate goals will depend on getting drivers into zero-emission cars and slashing pollution from the city’s drafty old housing stock. If the report serves to focus the city’s attention around those two problems, it’ll have been a success. Start with cars. As of 2017, there are only about 12,000 electric vehicles registered in the whole state (out of about 2.4 million cars), according to the Commission on the Future of Transportation . Historically, one barrier has been lack of infrastructure. But there are now 582 charging stations statewide, with 1,691 outlets. It makes sense to continue building out charging infrastructure, but other barriers — cost and perceived inconvenience — also need to be tackled. Unfortunately, the market alone can’t be relied on to solve the problem. Gasoline prices have fallen enough that electric cars now take longer to pay for themselves, according to the federal government’s vehicle cost calculator, a problem exacerbated in a state like Massachusetts with high electricity prices. One approach worth pursuing, according to the report, is to follow the lead of cities like Oslo, which provides free parking, toll-free roads, and other perks to electric car owners as an incentive. Another part of the strategy should be for the city to hedge its bets. Other zero-emission cars exist today that might be more attractive to some drivers than plug-in vehicles. For instance, California is building out its hydrogen fueling network, which has led automakers like Toyota and Hyundai to market their line of hydrogen cars there; Quebec is following suit. An advantage of hydrogen-fueled electric cars is that they can be refueled about as quickly as a gasoline car, negating one of the supposed drawbacks of battery-powered cars, and may eventually become cheaper. The technology is also more suitable for larger vehicles and trucks; Anheuser-Busch recently ordered 800 hydrogen-powered beer trucks. Boston needn’t pick sides between batteries and hydrogen, but fostering another option in the city would be helpful — especially since the report says there cannot be a single remaining gas-powered car or light truck left on the roads in 2050. The city should also be careful not to be overly prescriptive on pathways to reduce emissions from home heating. Electric-powered heat pumps are not the only way to heat a home without generating greenhouse gas emissions: Renewable natural gas and hydrogen are a potential “drop in” solution that potentially avoids the need for every homeowner in the city to buy a heat pump and would make use of the existing gas distribution network. Still, no matter how homes are heated in three decades, making them more efficient through retrofits will reduce energy demand. Mass retrofitting of houses — the report recommends around 2,000 to 3,000 a year — would require a workforce that currently doesn’t exist. That’s a potential employment opportunity that the city could work with community colleges and vocational schools to develop. The city has a tough task ahead. But by identifying the biggest opportunities, the report should help point the city forward. If Boston wants to go carbon neutral by 2050, here’s how that could happen.